So the other night I made a little surf ‘n turf with some grilled soy & sriracha marinated strip steak and panko shrimp cakes… Little did I know that the Instagram and Facebook responses on the shrimp cakes would be so strong, with people clamoring for the recipe! Awesome, thank you for your support and interest! 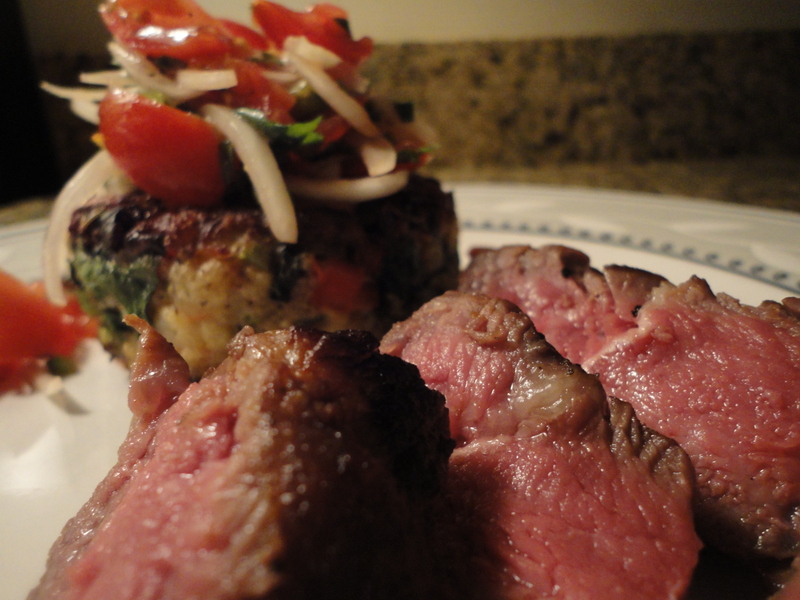 Well, you asked for it, here it is… I’ve also included the tomato, onion & jalapeno salsa that I topped the cakes with. 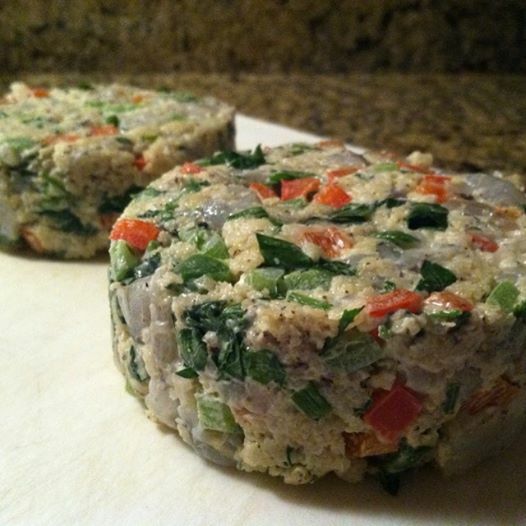 Ok, so the first thing we need to do is combine the ingredients for the shrimp cakes, because they’ll need to sit in the fridge for an hour. Combine all of the ingredients listed for the cakes in a bowl and mix thoroughly. Cover with plastic wrap and put in the refrigerator. The reason this mixture needs that much time is because of the panko. It needs time to absorb the moisture from the mayonnaise so it can bind the cakes. If you just throw everything together and immediately start cooking it will all fall apart. Next let’s move on to the salsa, which should be made 30 minutes prior to serving to allow the flavors to come together. Once again, just combine all of the ingredients listed above and mix well. Cover with plastic wrap and place in the fridge. Okee dokee, let’s get this ball rolling. Get the shrimp mixture out of the fridge and scoop out the portions by hand, rolling them into a ball. As far as molding them, if you have ring molds that’s great. You can use a 3″ mold for two large cakes or a 2″ mold for four smaller ones. Just place the balled shrimp mixture onto a flat surface inside of the mold, then gently press it to fill the space. If you don’t have molds, no big deal… Again, just put the balled mixture onto a flat surface and gently press down to slightly flatten them. Don’t make them too think or they’ll cook faster and possibly dry out. Heat the olive oil in a sauté pan on high. Once hot place the cakes in the oil, cook until lightly browned (about two minutes, panko cooks fast! ), gently turn over and repeat. Once both sides are browned put the cakes in the oven and bake for ten minutes to cook the center. Put ’em on a plate, get some of that salsa on there, and you’re all set. Quick, easy, delicious… doesn’t get much better. Use them as an appetizer, a side, or as the main dish. 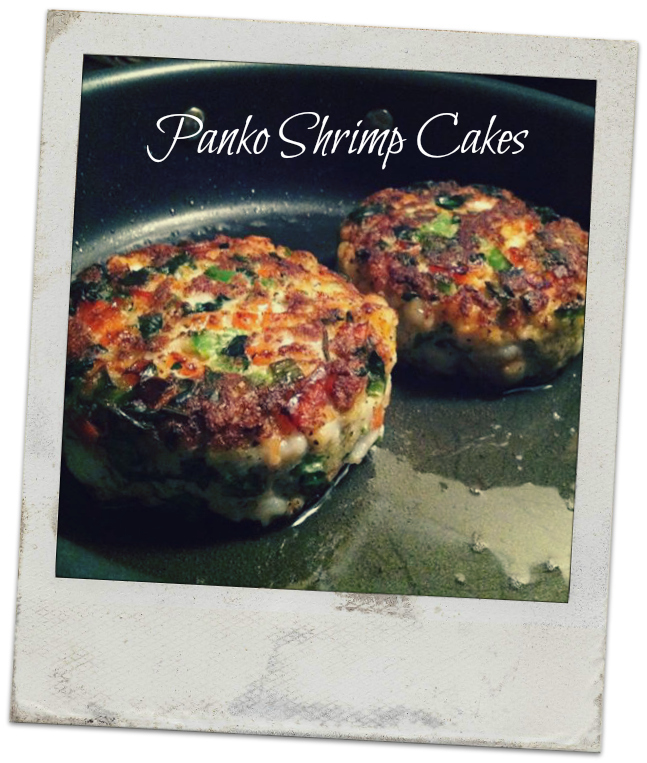 Tags: panko shrimp cakes, perfect pairings, perfect pairings at home, shrimp, shrimp cakes, summer. Bookmark the permalink. It is a Japanese style of breadcrumb. Larger and crisper. It’s a great binding agent.